Also called as the Heritage City, Vigan is one of the best examples of an Old School Spanish City in Asia. Some of the places to see are the: Crisologo Street, Arzobizpado, and Plaza Burgos. 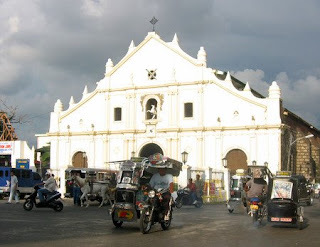 From the Partas Bus Terminal in #47 Governor Pack Road, ride a Partas bus to Vigan. From the Partas Bus Terminal at Paco Roman Street corner P. Zamora Street, ride a Partas bus to Vigan. Take the LRT-1 to D. Jose station. Take the LRT-2 to Recto terminal station and walk through the connecting foot bridge towards LRT-1-D. Jose station. From Divisoria, ride a jeep to Morayta, San Juan, or Cubao, and get off at Claro M. Recto Ave. corner Rizal Ave.
From Morayta/Recto/Legarda/Ramon Magsaysay Blvd., ride a jeep to Divisoria, and get off at Claro M. Recto Ave. corner Rizal Ave. The Phil. Rabbit Terminal is located at Claro M. Recto Ave. corner Rizal Ave.
Ride a Phil. Rabbit bus to Vigan. The ride takes 8-9 hours. 1. From the back of UST, at Dapitan corner Gelinos, ride a Maria de Leon bus to Vigan. The ride takes 8-9 hours. From Quiapo, ride a jeep to Cubao via Espana, and ask the driver to drop you off at A. H. Lacson (Gov. Forbes). The RCJ Bus Terminal is located at the point where A. H. Lacson (Gov. Forbes), Espana, and M. Earnshaw meet. Ride an RCJ bus to Cagayan via Laoag. Ask the conductor if the bus will pass by Vigan. The ride takes 8-9 hours. Go to New York Street, Cubao. The Phil. Rabbit and Dominion bus terminals are located at EDSA corner New York Street. Ride a Phil. Rabbit or Dominion bus to Vigan. The ride takes 8-9 hours. Take the LRT-2 to Araneta Center-Cubao station. Take the South Exit. Turn left, and walk about 3 blocks along Aurora Boulevard, past Gateway Mall, Gen. Araneta, Gen. Santos Ave., and EDSA, until you get to Pinatubo. Take the MRT to Cubao station. Walk 1 block along EDSA the way you came, past Farmers Plaza and Arayat, until you get to EDSA. Turn left at Aurora Boulevard, and walk 1 block until you get to Pinatubo. From Aurora Boulevard, ride a jeep to Cubao, and get off at Aurora Boulevard corner EDSA. Walk 1 block the way you came until you get to Pinatubo. The Partas Bus Terminal is located at Aurora Boulevard corner Pinatubo. Ride a Partas bus to Vigan. The ride takes 8-9 hours. Ride a bus to Vigan.